We don’t all want the same things when it comes to legal tech. Some people want significant change to the legal market, using tech as a means to help reach the goal of hugely increased access to justice and a reduction in the cost of commercial legal services to businesses. Other people want to maintain the status quo. And others feel that they have to go along with the status quo, against their will, because of the culture of where they work. Other organisations are grappling with real legal transformation and are committed to changing significant parts of how they manufacture their ‘legal products’ in ways that would shock many lawyers at other firms or inhouse legal teams. There’s a lot of impressive work going on around the world, with some firms and legal teams actively and quite consciously disrupting themselves. There are clearly then a wide range of views and goals when it comes to legal tech. We are not all on the same page. There are divisions. There are competing narratives. There is a battle of ideas to see which ones win out and different people, firms and organisations are arguing for different points of view. The legal tech world is, in a word, political. On one side are those who want things to really change, seeing the value in true transformation of the means of legal production (rather than the tired and self-defeating mantra of ‘incremental innovation’). Often the proponents of change are unable to realise their ambitions in the short, or even medium term. It is not unusual to find it hard-going with the deep cultural and business practice barriers within the law, (see The Unexpected Truth, below). On the other side is the sometimes unconscious, sometimes cynical, effort to make sure that nothing significant changes very quickly at all, signing off real change as impractical and that it’s better to strike out with low horizons, when aiming low in a world of glacial change seems exactly the opposite of what we need. Some of its proponents really believe they are doing ‘a good thing’ by preventing change, by preserving the old order, by keeping us in the past. Some are just misguidedly protecting roles that need to change in an act of dubious self-preservation. Others seem to object simply to the idea of technology encroaching into not just supporting legal work, but actually doing legal work of any type, no matter how mundane and in whatever shape this takes. Legal tech is therefore political in the true sense. All parties cannot win at the same time. It’s a battle of ideas, of visions for the future of the legal market, and deciding what our many societies around the world should expect from the legal systems we have created. Because the law does not belong to lawyers, it belongs to all of us. Where lawyers fit in and how they fit, should be left for society to decide based upon what people want from the legal system. So, where does this leave us? If we don’t all want the same things from legal tech, and if some of us are in fact completely opposed to the others’ goals and objectives what happens now? It leaves us with a political system. And if there were a legal tech election tomorrow, who would you vote for? And why? To figure this out we need some political parties, or at least movements, to give some rational shape to this reality we live in. The Progressives – who want real change, actual transformation of the means of legal production in the fullest sense. That may need – in fact almost certainly needs – some level of automation to make this possible, although the human-centric design focus must never be lost, because after all, what is all of this for? The Conservatives – who want BAU with some ‘incremental innovation’ knobs on to give a nice impression of delivering value. Tech is really not seen as a means to an end, at least not one that has strategic and business change significance. It’s more around making things a bit more comfy for all involved, it’s ‘nice to have’ operational tweaking, rather than seen as essential to the ecosystem. The real core of the traditional means of production, i.e. the manual, hourly method, is all good, no need to really change that. Nothing to see here, move along now, move along…. These two positions are not easily reconciled, even if the reality for many in the legal sector is that for practical expediency they need to navigate – at least for professional survival – between these two poles. This could mean staunch conservatives making the right noises about innovation at conferences to impress clients, or for GCs to ‘prove value’ to CFOs, but not really mean it at heart. Or, it equally could mean having to bite your tongue when rolled out in front of the firm’s management committee when asked what you think the partners should do. We all live in the real world. People have jobs they (usually…) want to keep. But, that doesn’t stop us from believing in what we know to be true, nor when possible, pushing ahead with as much change as is sensible in a risk-averse environment. You are either seeking to find ways to meet client and own-business needs via automation to remove friction, reduce inefficiency, increase productivity and gain better data insights (whether that is through an AI tool or something else) or you are not. Having an AI system, for example, but hardly using it is what happens when you try to hold both positions at once. I.e. you can’t be pushing for change and then undermining it at the same time by giving yourself reasons not to implement real change. But, you can be pushing for more automation and find internal resistance that stops it, but at least you are trying – and hopefully will succeed eventually at this firm, or perhaps another. You either believe the legal market as it is today really needs to change, or you don’t. It’s a bit like man-made global warming – if you agree that it exists then the next logical step is to try and change the situation. Accepting global warming and acting as if it’s not happening is not a tenable situation in the long term, neither is working in a firm/inhouse team that is in denial about the need to change. 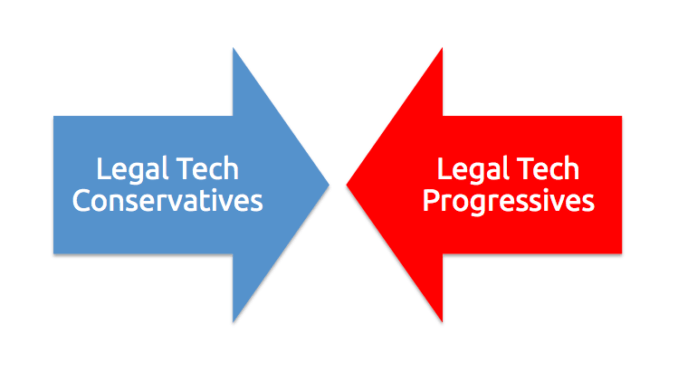 What we end up with, in broad terms then are two political poles: Legal Tech Conservativism (LTC) that tends to believe nothing major is wrong with BAU; and the Legal Tech Progressives (LTP) who firmly believe what we have today is not acceptable, even if on a day to day level it may appear to be ‘normal’ to many and that for the simple need to keep paying our bills by remaining employed by BAU lawyers we may have to tread carefully when expressing ‘our truth’. Also, as with all politics – and as we have seen in Europe and America recently – history doesn’t always move in a straight line, in an onward, always improving path upwards. However, things shake out eventually. They always do. How fast they shake out remains to be seen. The speed of change is also something we – as citizens of legal tech land – can influence. The more people who push for change the greater the likelihood things will change. And the more we seek to connect with forces external to the legal market – but with huge potential power to influence it – from company shareholders being massively overcharged for basic legal work, to the literally millions of people who are cut off from access to justice, the greater the chances that pressure will build on the outer edges of the legal market as well. There is only one thing that is certain: change will not come by itself. The legal market has stood resolutely still in terms of how legal work is made for decades, if not centuries. That there are powerful conservative forces is no surprise. But they can be overcome. And they will. Over the last couple of years, and especially since Artificial Lawyer appeared on the stage, I’ve met people representing a huge variety of views and been surprised that the reality on the ground is not what everyone may assume. Young lawyers who hate the idea of automation, even of the most tedious tasks. Some fear replacement, some explicitly say they don’t want to be pushed into doing higher value, more complex work early on, some just don’t want to be dragged off traditional fee-earning work to help with things like machine learning training because they think it may affect their standing in the firm. So much for the idea then that ‘the new generation will lead the way’. Sorry, but they won’t necessarily. Certainly not all of them. There are plenty of bright young things who are 25 going on 65 in their view of the legal world. Very experienced equity partners who are very keen to drive through radical change, embrace automation, who want to find out what clients want and build it, and do everything in their power to transform the business, but…. (and this shocked me too…) find that the head of IT/innovation was having none of it. And as the partner felt disempowered to get to grips with the tech by themselves ended up putting their hopes of change to one side. And, equally to my amazement, I’ve encountered founders – very few in number it is true – of what would appear to be pioneering legal tech companies, doing their utmost to defend the current lawyer monopoly and the out-dated business model of the status quo. There have also been plenty of people who don’t really mind either way. How the legal market turns out in the long term is not a big issue for a lot of people who work in legal/legal tech land. Just because you work in legal technology doesn’t mean you lie awake at night worrying about access to justice or the demise of the billable hour. Whether a law firm is highly inefficient or a model of business process transformation may not matter as much as just doing the day job well and going home. Heads of innovation at most large firms do genuinely want real change, even if it’s hard-going internally. Legal ops experts do want to leverage automation, even if not internally, but there is little they can do if the GC who runs the inhouse team is reticent to engage with the issue or is more focused on making sure BAU is maintained and risk controlled above all else. And most tech companies involved in automation, data analysis and AI, also want rapid change – as that would support what they are selling, as one would expect. Though, that said, in order to sell transformational tech it’s sometimes necessary to tone down the message and make it less threatening. You can be a Progressive in heart and soul, but be pragmatic enough to realise telling the partners they are totally wrong won’t help pay the mortgage. For me, the real question is: where is your heart at? In the long term change will come if enough of us push for it. Excellent and thought provoking article Richard. I was surprised as many others I am sure, that you find some young lawyers “hate the idea of automation”- that seems counter intuitive in today’s millennium-centric, digitally driven world. The legal function has been the most resistant historically to technology amongst its peers and that will take time to change. However it finds itself, perhaps unwittingly, in the vanguard of narrow AI adoption, especially in the field of text analytics, given the vast quantities of documents it deals with and their importance,. So it has a chance to lead in a technology area, something I doubt it has ever done given its late adopter profile. To my mind the key is going to be in educating young legal trainees in this technology and adapting curricula to include automation and technology. The recent Duke Law AI showdown that you covered on your site shows how quickly students pick up machine learning and can put it to use. This is a really excellent analysis of the legal and legal technology industry, in my humble opinion. 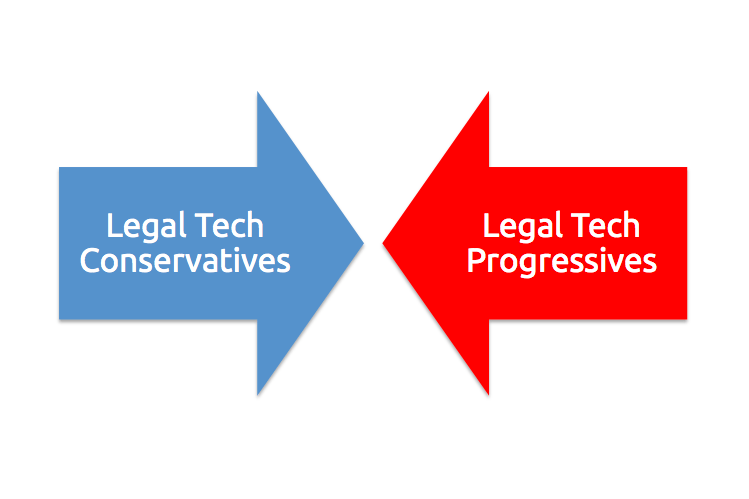 I like to think of myself as one of the Legal Tech Progressives. I feel I fit into that party quite easily. Nevertheless, we cannot leave the LTC’s behind. As with any successful politically motivated operation, we need to compromise for the greater good. We need change. That much is apparent by the number of people who are under-served by legal services. How we proceed to the future is important because we do not want to sacrifice quality for expediency. All that said, we still need to push forward with efficiency and improvement.